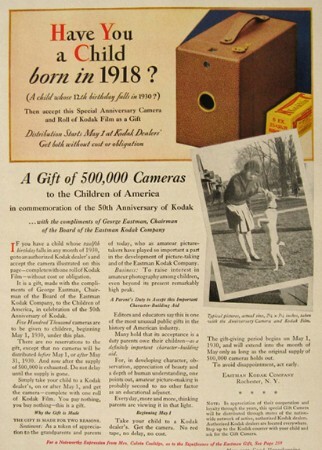 To commemorate the fiftieth anniversary of the founding of the Eastman Kodak Company every child in the U.S.A. and Canada whose 12th birthday fell in 1930 received this camera for free. During May 1930 every child, accompanied by a parent or guardian, could go to a Kodak dealer and receive the camera and a roll of film. No cameras would be given before May 1 or after May 31 and none after the supply of 500,000 (in the U.S.A.) was exhausted. 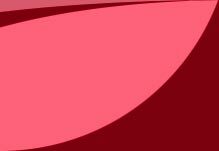 It seems that within two or three days all were gone. The Fiftieth Anniversary Kodak is a special version of the No. 2 Hawkeye Camera Model C (1926-1934), featuring tan leatherette, gold colored metal parts and a gold colored seal. It takes 6 pictures of 2.25 x 3.25 inch on a 120 size spool of film. The camera is very simple, with only the shutter button to operate and the film advance key. No diaphragm settings, no shutter speeds, no time or bulb settings. There is only one finder on top. all, but mostly only the camera is offered for sale, and many are in worn condition. The set in the video was never used and has a pristine camera, a very clean box of film, the instruction booklet and a dealer card. The box is a bit worn but complete. 3. to stimulate photography still further by giving so many children their first camera, hoping they would become enthusiastic amateur photographers.